For those of you who need to follow a schedule when working out, look no further. Each month I will be posting a calendar filled with quick and basic workouts for you to do along side your regular workout plan. I am going to start with March since it is right around the corner and go on from there. Let me know what you think of this calendar and if there is something you would like me to add to next months that I don’t have now. 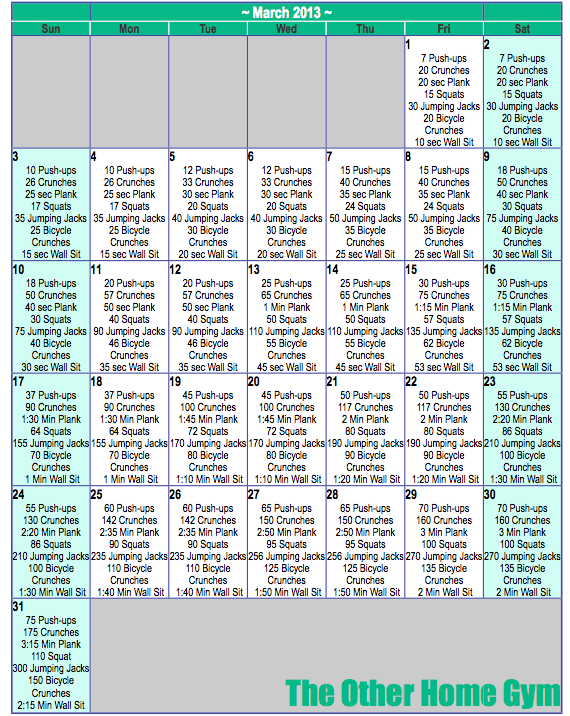 I designed March’s monthly plan as a way to increase stamina and ability for these basic workouts. Every two days the number of reps for each workout will increase. If you cannot complete the number of reps for a specific exercise at one time, break it up into multiple sets with a quick break in between. TIP: Stretching before and after a workout will help loosen up your muscles and helps to reduce muscle cramps after working out. The beauty of this workout is that it is quick, easy and can be done anywhere. Because there is no equipment involved, this daily workout schedule is perfect for working out at home or while traveling. Having a workout schedule is a great way to make sure you get your workout in. There are plenty of days when I don’t know what to do for a workout, do when to do them so I created this calendar to make sure I get some form of a workout in each day. The March calendar I created for you all is a combination of these things. To get a well-balanced workout as described by Livestrong, you should incorporate 30-4o minutes of cardio, stretch before and after your workout, and combining weights and resistance bands for strength training will help to bump up your workout. I created a calendar like this for February, not knowing if I was going to be able to reach the high numbers at the end of the month and I have! I can honestly say that if you put forth the effort to make sure to complete these workouts every day you can make it to the end of the month. Getting to March 31st is not going to be easy but it will be worth it. TIP: Hydration is key to any good workout. Drinking 8-12 glasses of water a day to maintain hydration levels in the body. Right after your workout, drink 1-2 glasses of ice cold water to help increase the number of calories you body burns after the workout. March is only a few days away so if you have any questions regarding the calendar I posted please let me know! I will be completing each item on the calendar so look out in my next few posts for quick blurbs on how I’m doing with the routine. Look forward to hearing how you are doing. Hello, i think that i saw you visited my blog so i got here to return the prefer?.I’m trying to in finding things to enhance my website!I suppose its ok to make use of some of your ideas!! I really like the idea of making a calendar to keep up with your workouts! I feel like it’s much easier to stick to something when you make a routine out of it. I also like how you provided the link in case we wanted to download it–I’ll definitely be using it! I think you give a lot of good tips and workout ideas throughout your blog. I’ll keep checking each week to learn more! Thank Hallie! Let me know how March went. April is now up so go and try it and let me know what you think!